DISABLED adults were left dismayed when vandals destroyed and stole their gaily decorated work put up in Woking Park for everyone to enjoy. 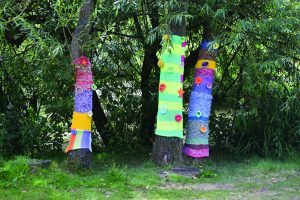 Residents at The Grange, a charity at Bookham, had been busy knitting for a “yarn-bombing” project at the Party in the Park event last month. But vandals destroyed the colourful creations after knitting was left on site in the park on trees, a bench and a bridge sometime after July 8. “It is so sad. The work had been on display for everyone to enjoy,” said tutor support staff member Tina Williams. Yarn-bombing involves knitting and placing the finished creations in public places for all to enjoy. On this occasion, residents followed the Party in the Park theme of the 60s and 70s to create woolly works including a depiction of famous model Twiggy. Usually, the work would be collected up and displayed at fresh venues at a later date. In the past residents have created work for The Lightbox gallery and museum in Woking and the G Live entertainment centre in Guildford. The Grange provides support and residential care for people with disabilities from across Surrey. Staff teach a range of arts and crafts skills on site.